The OnePlus 5 was launched in India in June this year, and it was made available on Amazon India, and the OnePlus store online. If you wanted to buy it offline, the only way you could do it was head over to the OnePlus Experience Stores in Delhi and Bengaluru. Now, in a bid to begin charting its offline presence in India, the company has announced that the OnePlus 5 will be made available in Croma retail outlets across India as well. This is the first time OnePlus has collaborated with a retail outlet to sell its smartphones offline in India. The company first had an exclusive partnership with Amazon India, and then branched out the capacity to its official OnePlus online store. Only recently, did OnePlus launch its experience stores in the two cities, with a promise for expansion in more cities eventually. It also sets up pop-up stores in various cities during initial launch days for users to be able to try out the smartphone, and buy it there instantly. But that is usually a temporary affair, after which users had to rely on Amazon or OnePlus online store for the purchase of the smartphone. Now, for the first time, OnePlus will make its OnePlus 5 flagship available in Croma retail outlets across the country from September 19. The OnePlus 5 price in India is Rs. 32,999 for the 6GB RAM/ 64GB storage variant, while those who want to purchase the model with 8GB RAM/ 128GB storage will have to shell out Rs. 37,999. Colour options include Slate Gray, Midnight Black, and Soft Gold. 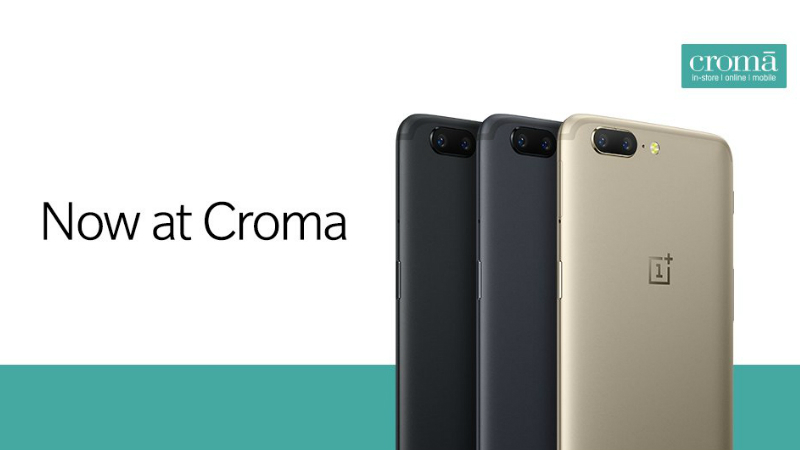 Promotional offers that will be applicable while buying through Croma have not been revealed yet. The OnePlus 5 has a 5.5-inch full-HD screen, Android 7.1.1 Nougat operating system with OxygenOS skin on top, and is powered by the Snapdragon 835 processor. The smartphone's camera setup on the back consists of primary 16-megapixel and telephoto 20-megapixel sensors, while the front camera has 16-megapixel resolution. As for the battery, OnePlus 5 comes with a 3300mAh battery with Dash Charge support for quick-charging.